Try our Fresh Peach Salsa for an exciting new topping. 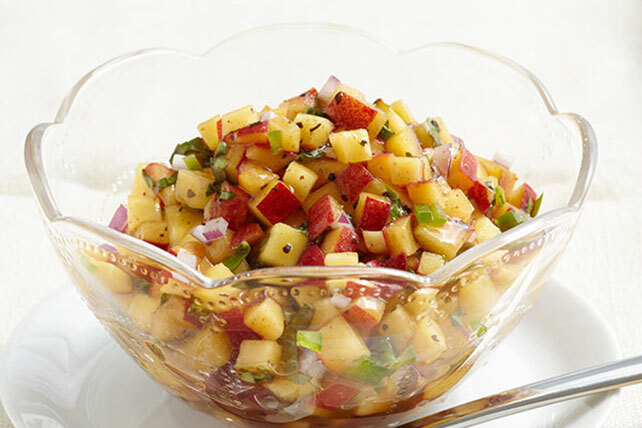 Our Fresh Peach Salsa is sweet and savory with some jalapeño added for an extra, spicy kick. Substitute cilantro for the basil and/or habanero peppers for the jalapeño peppers. Ripe peaches are intensely fragrant and will give slightly to gentle pressure. Avoid those which are hard or have soft, mushy spots or bruises. To ripen peaches, place them in a paper bag along with an apple. Close the bag, then let it stand at room temperature for 1 or 2 days or until peaches are ripened. Store the ripe peaches in a plastic bag in the refrigerator for up to 5 days. Prepare using up to 2 Tbsp. chopped fresh basil.